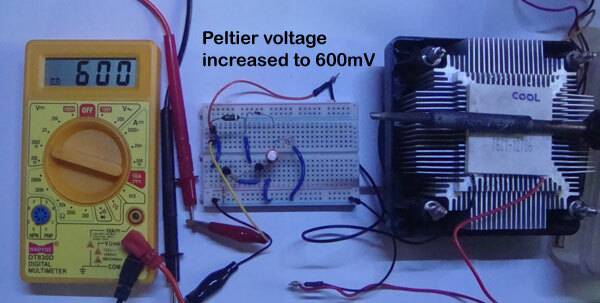 Peltier is an ideal device to demonstrate “Free Energy “. 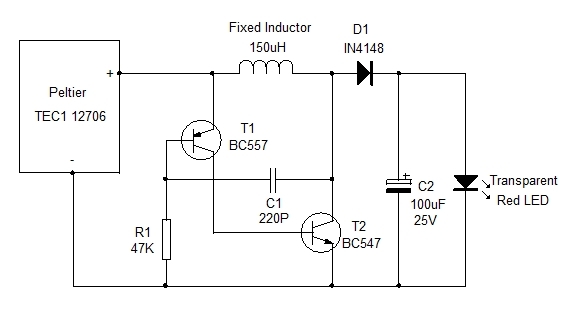 It can generate around 1.5 V and around 400 mA current when its one side is heated. 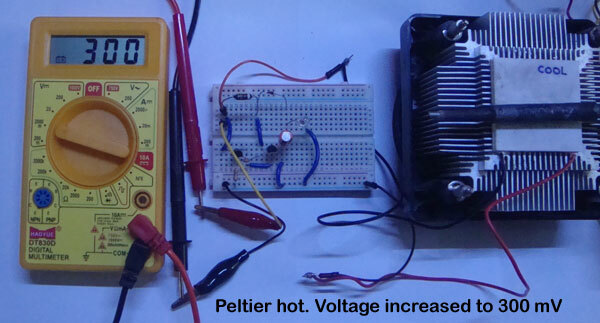 If we connect 5 Peltier modules serially, the voltage can be increased to around 7.5 volts with a current of around 400 mA when heated. In this set up, we can even charge a Mobile phone using Free Energy. In the given project, an LED lights when the Peltier is heated. A hot soldering iron is used to heat the Peltier. 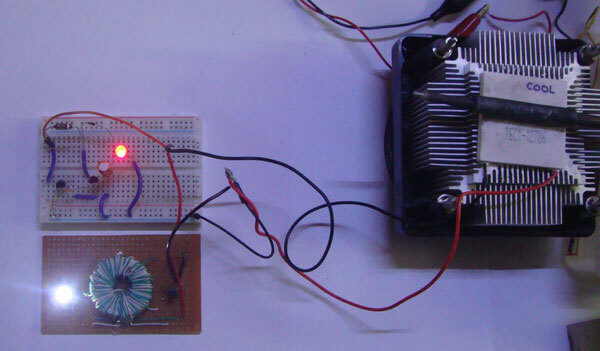 The output from the Peltier is connected to a voltage booster circuit using two complementary transistors BC 547 and BC557 and few other components. 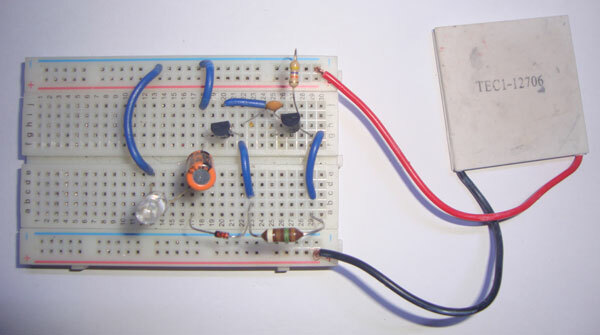 A 150 uH fixed Inductor along with a 220 P capacitor induces a Magnetic flux in the circuit. So the output from the circuit boosts to light the LED. 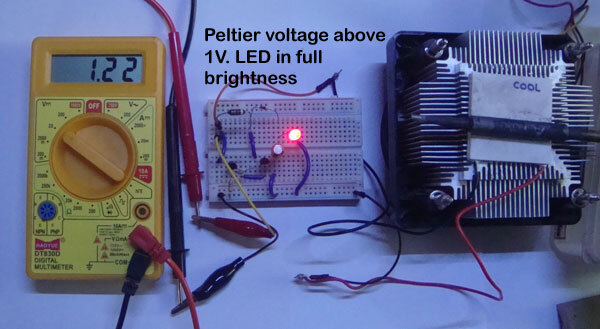 If the LED is directly connected to the Peltier and heated, LED will not light because the voltage will not rise up to 1.8V to light the LED. So this booster circuit is necessary. Apply heat sink compound on the Peltier as well as on the Heat sink. Fix the Peltier over the heat sink so that the heat sink compound forms a layer between the Peltier and Heat sink. This helps to transfer heat easily from the Peltier to the heat sink. 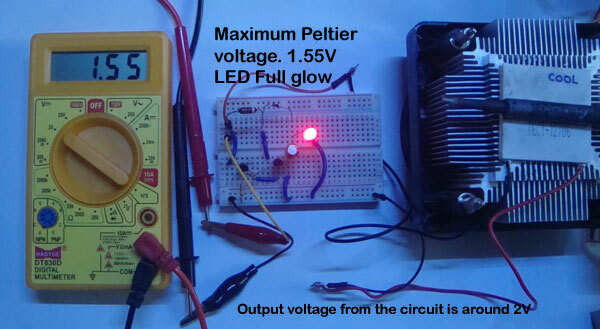 Then only the output voltage from the Peltier increases. Otherwise, the voltage drops after reaching a level. This is because the Peltier reverses its cold and hot sides, if its heat is not dissipated. 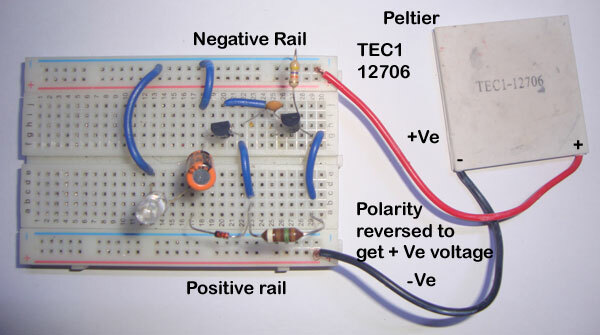 Peltier has Polarity which can be reversed. The Red wire is Positive and Black wire is Negative if we apply current in it to make the cooling device. But when we make a Free Energy circuit, The Black wire should be connected to the Positive rail of the circuit and the Red wire to the Negative rail of the circuit. Otherwise, negative voltage comes from the wires. For example, if we check it using a Multimeter with Red wire to Red probe and Black wire to Black probe, meter will show , for example -180 mV. If we reverse the connection, the voltage becomes 180mV which is positive. Peltier Black wire – Positive rail of circuit. When the voltage increases above 650 Milli volts, LED gradually starts to glow. This is because, the base voltage of the transistors are increasing above 0.6V for triggering. When the voltage rises to 1.5V, LED glows with full brightness. Check the current from the Peltier, using Multimeter. It can be between 300-400 mA at 1.5V. 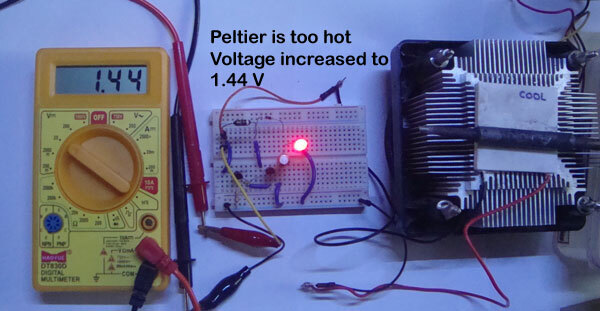 So current is enough in Peltier, but the voltage is the ever changing one. It will not remain steady and always show ups and downs due to changes in the heat. For example, a wind can drop the voltage. But if we use, the voltage booster circuit, the LED will glow steady between 600 mV to 1.5V from the Peltier. 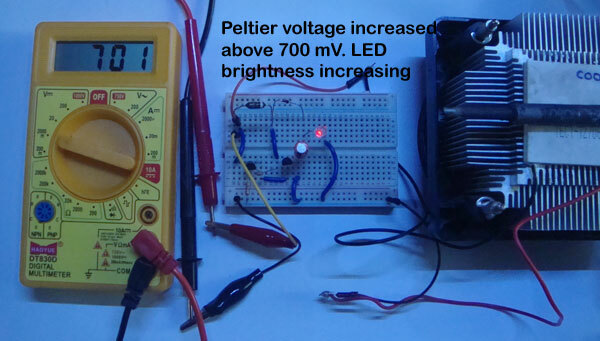 With a Joule Thief circuit, we can light 1 Watt White LED from Peltier Electricity. See next post .